Egypt is the land in which civilization was nurtured. Steeped in history, it evokes memories of a glorious past. For millenniums, Egypt was and still is the cradle of civilization; it's rich in history and monuments proof of the heritage of humanity. En-route between Aswan sightseeing and Luxor sightseeing on a Luxury Nile Cruises ships is the only way to appreciate the mysteries of all Ancient Egypt in Aswan (Nile Felucca), Kom Ombo, Edfu, Esna, Luxor, Qena, Luxor Temple, Karnak Temple, Kom Ombo Temple, Edfu Temple, Ramsis Temple, Nefertari Temple, Horus Temple. Ancient Egypt is home to some of world's greatest wonders and some of these treasured sites are situation along the Nile River between Aswan and Luxor. An Ancient Egypt trip along the Nile River is like a journey back in time itself. You can travel in comfort on this Pharaonic dynasty making stops at the landmarks of history; your voyage will be a luxurious passage of discovery. Nile River Cruises begin in Aswan or Luxor, covering a distance of 200 kilometers. Throughout your Nile River Cruise you will be accompanied by a knowledgeable tour guide who will provide in-depth insights and a comprehensive understanding of the ancient Egypt Kingdoms. In Luxor cross the West Bank to the Necropolis of Thebes and Oris, God of the underworld. Venture into the tomb of the Boy King Tut-Ankh-Amun. En-route at Esna, visit the recently excavated temple of god Khnum and then stop over at the Temple of Horus built in commemoration of the battle between Horus and his brother Set. Further down the river the Temple of Kom Ombo is dedicated to the crocodile and healer gods. At Aswan wrap up the journey with a ride in a lateen-sailed Nile Felucca and a visit to the Temple of Philae dedicated to the Goddess Isis. Following is a list of our featured Luxury Nile River cruise ships we offer. We personally select each Luxury Nile River cruise ship we offer based on stringent quality control standards. We are confident you too will appreciate our selection we discriminately recommend. Ancient Egypt Sightseeing excursions are included in our Nile River cruises; guided sightseeing in Aswan, Kom Ombo, Edfu and Luxor, Karnak temple. Time permitting optional day tour to Abu Simbel may be included which start and end in Aswan. Following is a list of our featured Nile River cruises ships we offer categorized by standard. 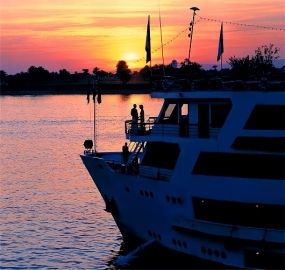 To view complete details including day-by-day sailing itineraries and routes for a specific Nile River cruise ship click on the name of the Nile River cruise ship of your choice. We offer different Egyptian holidays combining a Nile River cruise with visits to the main sights of Egypt. We offer many cruise and stay options, of lengths from 8 to 17 days. Itineraries can include Red Sea Diving Holidays, Red Sea Liveaboard Safari, Western Desert Oasis Safari, Cairo and the Pyramids, or extensions to Abu Simbel by lake Nasser Nile River cruise ship or air. From Cairo fly to Luxor or Aswan to join your Nile River cruise ship - alternatively start your holiday by direct flight to Luxor. From Luxor some cruises go north to Dendera, for a visit to the temple of the God Hathor, then sail back to Luxor. From Luxor visit the Valley of the Kings, with its hundreds of tombs, most famously that of Tutankhamun. See also the Valley of the Queens, Deir El Bahri, the mortuary temple of Queen Hatsheput and the Colossi of Memnon. Cruises also offer visits to the temple complexes of Luxor and Karnak, both noted architectural sights. Your cruise ship sails via the river lock at Esna to Edfu. The temple of Edfu, dedicated to the falcon-headed God Horus, is one of the best preserved in Egypt. Further down the River Nile is the famous Kom Ombo temple dedicated to the crocodile God Sobek, with its mummified crocodiles. The Luxury Nile River Cruises listing below shows the length of each cruise holiday and the areas covered. Kindly Click on the Luxury Nile River Cruise name to reach the detailed information pages.